This post contains affiliate links. I only post links to products I completley trust and highly recommend. Please see full disclosure here. I have to admit to you all that I’m definitely a movie nerd. That doesn’t just mean that I watch a lot of movies. It means that I actually research and read about movies too. Apparently, just watching a movie isn’t enough for me. Nope, I have to analyze it too. I also keep a list of all the movies I’ve watched within a year and give each movie its own rating on a scale of 1 to 10 and write a few comments about it. Last year, I watched 71 movies. I don’t know if I have too much time on my hands or if this is just a really passionate hobby of mine. I choose to believe the latter. Yes, my name is Alyssa and I’m obsessed with movies. Unfortunately, this year I wasn’t able to watch as many of the Oscar nominees for best picture prior to the big event. I’ve only seen “Hell or High Water” and “Hidden Figures” so far. Hmm… maybe I do have a life outside the movies, after all? 😉 Which ones have you all seen? What’s your favorite? Drop a comment below and share with me! Since I’m such a movie junkie, I obviously have a special recipe that I created just for the Oscars. 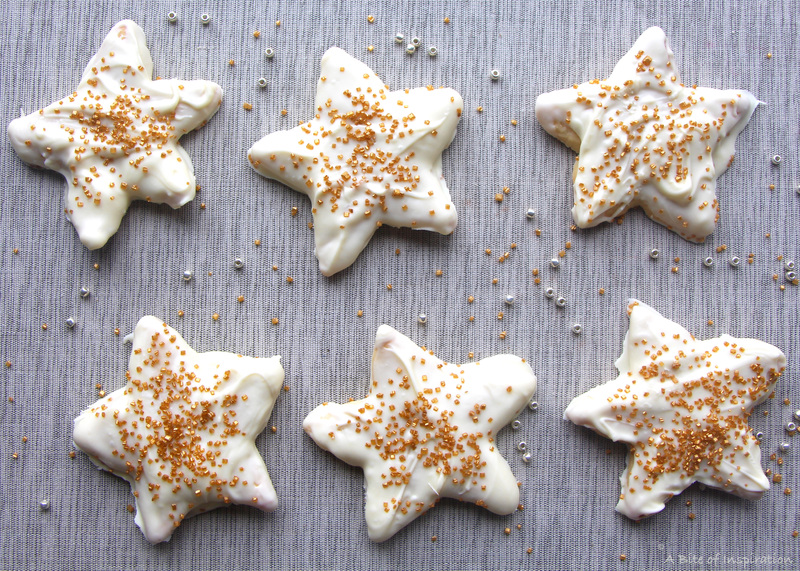 I’ve harnessed all the star power of Oscar Night to bring you these Gold Star White Chocolate Cookies. These cookies are divine—I could eat them all in one sitting. 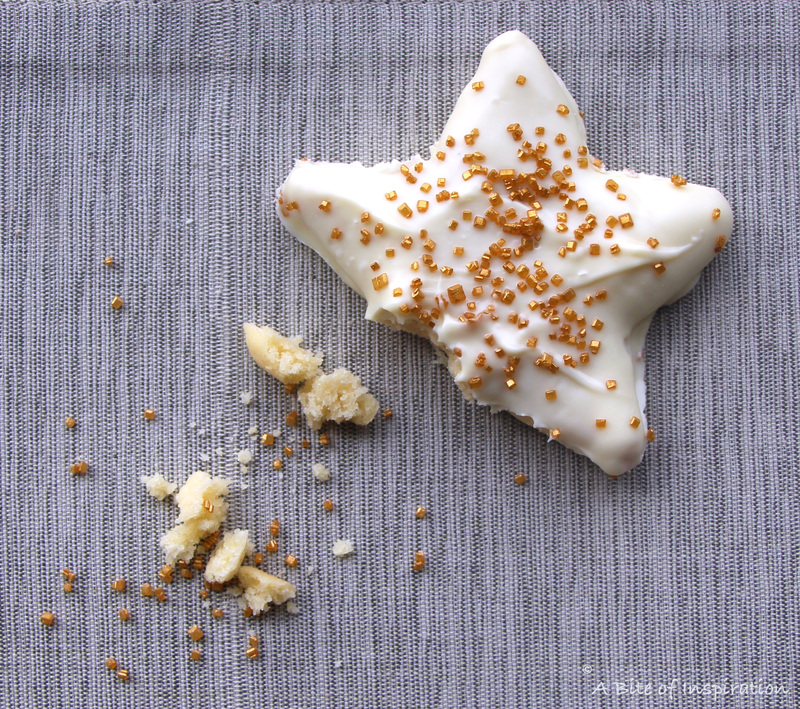 Soft, sweet sugar cookies dipped in creamy white chocolate and finished with a bit of gold sugar to add that touch of shine—what’s not to love? They’ll be the talk of your Oscar party, guaranteed! make them for yourself because, let’s be real, you’re the real winner of the family—you deserve just as much love (and COOKIES) as everyone else! Seriously, guys. Nothing makes someone feel like a winner like a delicious star shaped cookie dipped in chocolate and topped with gold. P.S. If you want to use the same gold sugar that I used for this recipe, you can get it here ! You can also get the same 3-inch star cookie cutter I used right here . Add butter and sugar to a mixing bowl. Cream butter and sugar with an electric mixer until smooth. Add eggs one at a time beating with mixer until smooth. Add vanilla. Beat with mixer until combined. In a separate bowl, add flour, baking powder, and salt. Mix well until combined. Add the bowl with the dry ingredients into the wet ingredients. Beat with mixer until well combined. Cover the dough and place in the refrigerator to chill for at least 2 hours or overnight. Roll out dough on a lightly floured surface to about ½ inch thickness. 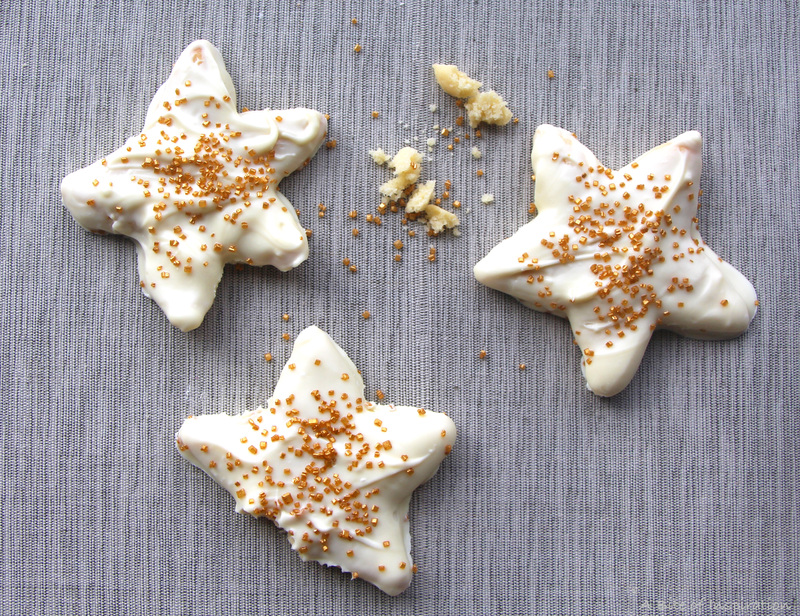 Using a 3-inch star shaped cookie cutter, cut shapes into the dough. Re-roll any remaining cookie dough and repeat the process from step 9 until all the dough is used. Place cookies 1 inch apart on a cookie sheet. Bake for 8-10 minutes until the edges begin to brown. Carefully remove the cookies from the oven and allow to cool completely. Take one cookie and carefully dip the top of it into the white chocolate. Let excess drip off. Place cookie onto parchment paper and sprinkle with the gold sugar. Repeat the process with the remaining cookies. Place cookies in the fridge for 30 minutes to allow chocolate to harden. Enjoy! White chocolate seizes up easily, so be sure to keep an eye on it while it's melting. I recommend you melt the chocolate in a double boiler because if you do it in the microwave, it is more likely to become lumpy. After the chocolate is melted, stir well to get rid of any lumps. Be sure to scrape down the sides of the bowl as you’re mixing. You can flour the cookie cutter to keep it from sticking to the dough. What a cute idea! These would be great for an Oscar party, but I also love the idea of making them for a celebration for kids. I bet they’ll freeze pretty well, too, so I can always have them on hand! What a cute idea! I sadly don’t manage to see nearly enough movies, despite my best intentions, but I could definitely see making these with my son as a “reward for something. (When he’s a little older. 😉 Thanks for sharing! Thank you so much, Monica! I’m sure your son will love these when he’s old enough, but until then you can definitely make them for yourself! 😉 Enjoy! These are just so fun. Make them for the Oscars of course but I think they would be super at Christmas time as well. Great tip on the double boiler as well. Good practice in general. Thank you so much, Romain! They would be perfect for Christmas– what a great idea! And, yes! A double boiler is so important for melting chocolate, especially white chocolate. Thanks for stopping by! Super cute cookies! Great suggestions too. I wish I watched more movies. 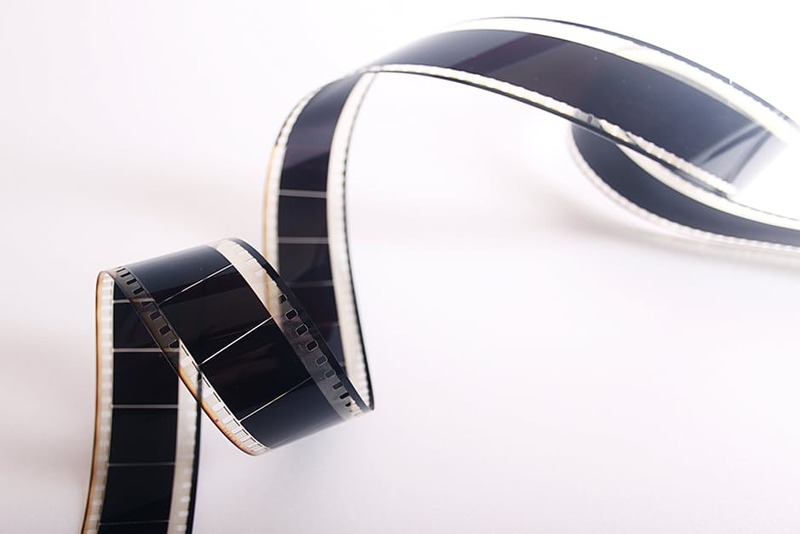 My goal is to watch all the Best Picture nominated movies or at least the Best Picture winner! I haven’t seen a single one so far. Sigh. Thank you so much, Marie! Haha don’t feel bad about not watching enough movies. I clearly watch TOO many movies and I still haven’t seen many of the best picture nominees this year. Lucky for both of us, we now have the perfect movie watching cookie to munch on. 😉 Thanks for stopping by! These are so cute! I absolutely love the look of gold sprinkles and white frosting. And they look like they taste delicious, too! Thank you so much, Riva! I’m a big fan of the gold sprinkles too. They really add something, don’t they? Thanks for stopping by! 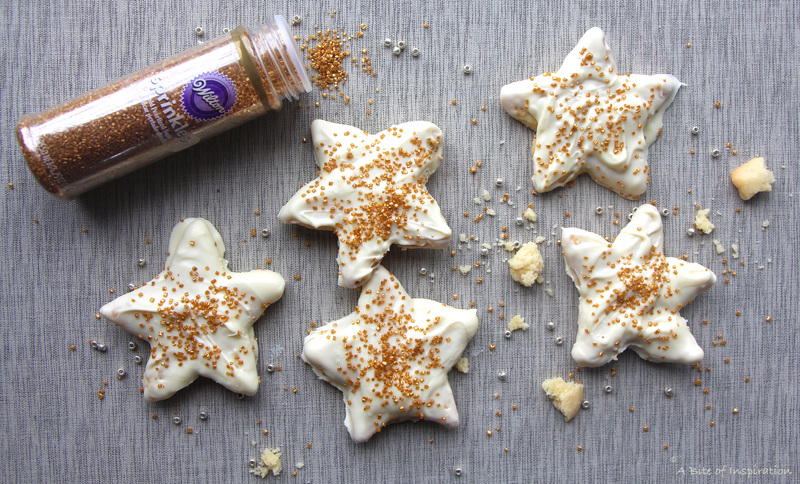 These star sugar cookies are just adorable! Even better, they’d be appropriate for so many special occasions throughout the year! Movies make you happy, sprinkles make me happy! Thanks for such a fun recipe! 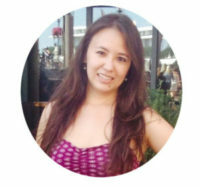 Thank you so much, Erica! Sprinkles make everybody happy. 🙂 Hope you enjoy! These cookies are so beautiful. Sad to say I missed watching the Oscars this year. Before having kids I watched all the awards. Now I’m lucky if I keep my eyes open. Thank you so much, Jenna! Totally understand the feeling. Hope you can catch the Oscars next year! Thank you so much, Joyce! I’ve heard great things about Lion, but haven’t seen it yet. Mateo said it was “one of the best movies he’s ever seen”, so I’m sure we’ll be watching it together soon. I find it easier to watch a movie if it’s something I’m really interested in. Plus the fact that I usually read reviews of the movie before I watch it (yup– I’m one of THOSE people) makes it easier for me to pay attention so I can catch certain things. Also, COOKIES help me pay attention. Nothing keeps you awake like a cookie covered in white chocolate. haha 😉 Hope this helps! Enjoy!